Clorinating Sanitizer for Shake machines, soft serve machines and kitchen utensils. Scroll for more Info, Specs & Related Items. Aluminum, Brass, Copper, Chrome, Corian®, Glass, Glazed ceramic, Glazed enameled surfaces, Glazed porcelain, Iron, Laminated surfaces, Linoleum, Metal, Plastic (such as nylon, polystyrene or polypropylene), Plexiglass, Porcelain, Rubber (such as EPDM or Viton), Sealed granite, Sealed limestone, Sealed marble, Sealed slate, Sealed stone, Sealed terra cotta, Sealed terrazzo, Stainless steel, Vinyl and plastic and Vinyl graphics. 1. Remove mix from the machine. If local health codes permit rerun, place mix in sanitized rerun container and store in refrigerated cooler. 2. Rinse the interior of the machine (cylinder, feed tubes, etc.) by activating the “Wash” cycle and drawing through 2 gallons (7.6 liters) of lukewarm water. Repeat the rinsing procedure until the water runs clear. Turn the machine to the “Off” position. 3. 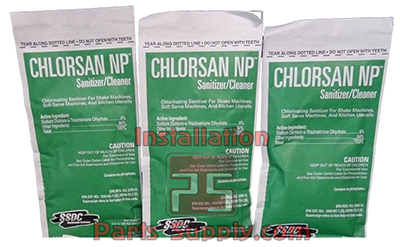 Prepare a cleaning solution of CHLORSAN NP by dissolving 1 packet in 2½ gallons (9.5 liters) of lukewarm water. 4. Clean the interior of the machine by activating the “Wash” cycle and filling the cylinder and feed tubes with the cleaning solution. Turn the machine to the “Off” position. Brush clean the feed tube and inlet hole. With the cleaning solution in the cylinder, reactivate the “Wash” cycle and allow to remain on for five minutes. 5. Drain the solution from the machine. Turn machine to the “Off” position. 6. Remove and completely disassemble all machine parts (door, blades, pump, etc.). 7. Brush wash all disassembled parts in a suitable detergent in a clean sink. 8. Rinse thoroughly under clean running water. 9. Sanitize parts by immersing for at least 1 minute in a fresh CHLORSAN NP solution (1 packet dissolved in 2½ gallons/9.5 liters of lukewarm water). 10. Remove parts and allow to air dry. 11. Repeat the cleaning procedure for machines with two freezing cylinders. 1. Following manufacturer’s instructions, reassemble the machine. 2. Prepare a sanitizing solution by dissolving 1 packet of CHLORSAN NP in 2½ gallons (9.5 liters) of lukewarm water. 3. Sanitize the interior of the machine by activating the “Wash” cycle and filling the cylinder and feed tubes with the sanitizing solution. Allow the “Wash” cycle to run for 5 minutes. 4. Drain the solution from the machine. Turn machine to the “Off” position. 5. Repeat the sanitizing procedure for machines with two freezing cylinders. DO NOT RINSE. NOTE: Consult local ordinances for possible variation in procedures. 1. Scrape or rinse all loose food soils. 2. Brush wash with a suitable detergent. 3. Rinse thoroughly with clean hot water. 4. In a clean sink, prepare a sanitizing solution of CHLORSAN NP (100 parts per million available chlorine) in lukewarm water according to the dilution table. Immerse utensils or equipment for 1-2 minutes. Remove and drain. DO NOT RINSE. Place on a clean surface to air dry. Follow local health ordinances. Flood the surface with the sanitizing solution, or apply with a clean cloth, sponge, or spray, making sure to completely wet all surfaces for at least 60 seconds. Let air dry. Follow local health ordinances. Solutions may be prepared in appropriate dispensers according to the dilution table and drawn as needed. Prepare a fresh solution daily or when the available chlorine level falls below 50 ppm. Store clean wiping cloths in a solution of 1 packet sanitizer per 2½ gallons (9.5 liters) lukewarm water to keep them in a sanitary condition between uses.